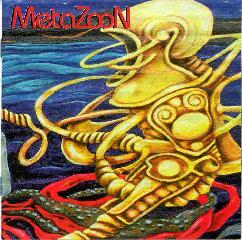 Metazoon is a ten-track compilation featuring six Finnish bands most of whom are in the space/psych realm and a couple progressive bands. The bands include Dark Sun, The Spiralothropes, Transparents, Moon Fog Prophet, Lotus, and Circle. Dark Sun's entry, the instrumental "TimeSpace Continuum" is a new track not featured on the Feed Your Mind CD. It's a little different than the songs on Feed Your Mind (see review in AI #1) and seem more overtly spacey. Far out synth washes and flute against a bass/drum beat that reminded me of Pink Floyd's Run Like Hell. Hope this means a new disc is on the way. The Transparents really impressed me with their heavy funk influenced spacerock. This may sound crazy but "Great Rush" reminded me of Rare Earth meets Deep Purple with a cosmic edge. "Arctic Grail" is very much along the Gong/Hawkwind axis and even had genuine Gong-like space whispers. Moon Fog Prophet isn't a space band but nonetheless had some of the strongest tunes on this disc. The band's sound is King Crimson influenced in much the same way Anekdoten is. "Follovers" is a heavy instrumental track with lots of mood and tempo changes and a good bit of dissonance thrown in for good measure. "Jesters Interve" introduces a vocalist that isn't bad but with only this one track to judge by I don't think he fits the music. These guys would be potent as an all instrumental outfit. On the somewhat weaker side are The Spiralothropes and Lotus. The Spiralothropes offer two tracks of guitar, bass, drum, keyboard and vocal psych. "The Blossom Queen Of Hearts" is the stronger of the two with its darker atmosphere. Lotus doesn't seem to be a space band though there is some drifting synths. Theirs is the longest track at 13 minutes and though it had some interesting ideas it didn't really hold my attention. The last two tracks are by Circle. Other than saying that Circle is amazing I'll simply point you to the other reviews we've done in Aural Innovations. My only complaint is that not all the bands have full recorded releases available so seek this compilation out and raise some interest. For more information contact Metamorphos; Rantamaki 2 B 6; Fin-02230; Espoo, Finland.